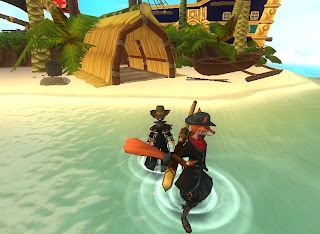 Ahoy Pirates! I have been playing around with the larger of the 2 new houses in Pirate101 The Buccaneer's Den is this massive house with so many features; water, trails that lead up and around and back down again and even what is part of a light house. Inside is just as impressive as the outside ; multi level rooms, spiral staircase, even added rooms to side of house to create those great bunking quarters. So let's begin, from the very first time I stepped into this house I knew what I wanted to do and with huts, palm tress and flowers. I created this small outdoor living/camping space. This smaller spot of the outside became a fisherman's hut as you can see his net, rope and even this really awesome boat is ready for the day of fishing. 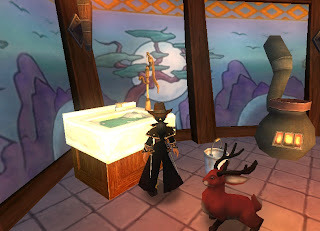 I added more screenshots of the fantastic views of this house in the slideshow at the end of this post. 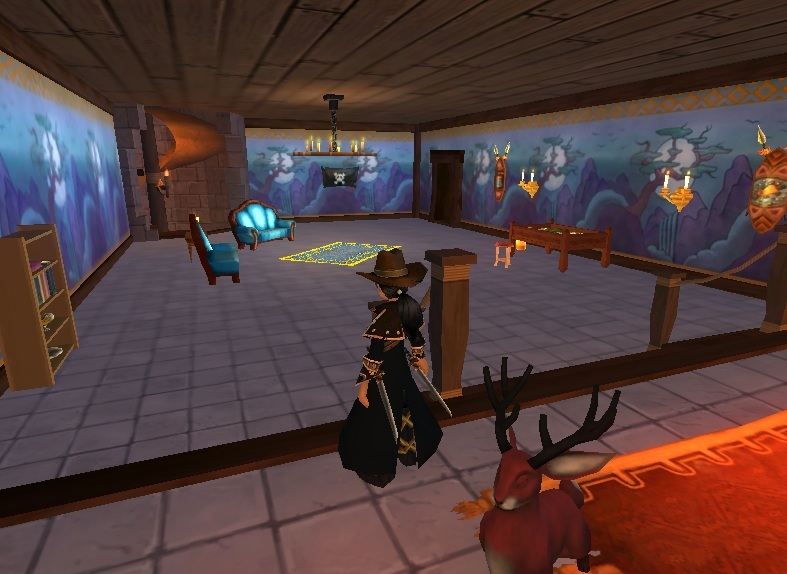 One we go inside this Pirate101 house, you can see the grand views from the very first room. 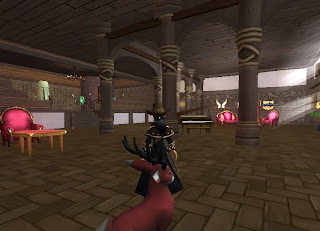 This multi level grand entrance shows so much detail that Kingsisle has added to Pirate101 housing. Furniture bought at housing venders adds that extra lived in feel to each and every room. Going up the spiral staircase leads you to the next stage of rooms. First room another large multi level in which I decided to create a elegant map/library room and my kitchen/ eating quarters. With some great new furniture pieces you can see the elegant style of living, One of my favorite pieces is the kitchen sink! Yes I know I have been wanting this forever. The water in this sink actually moves and has soap bubbles. 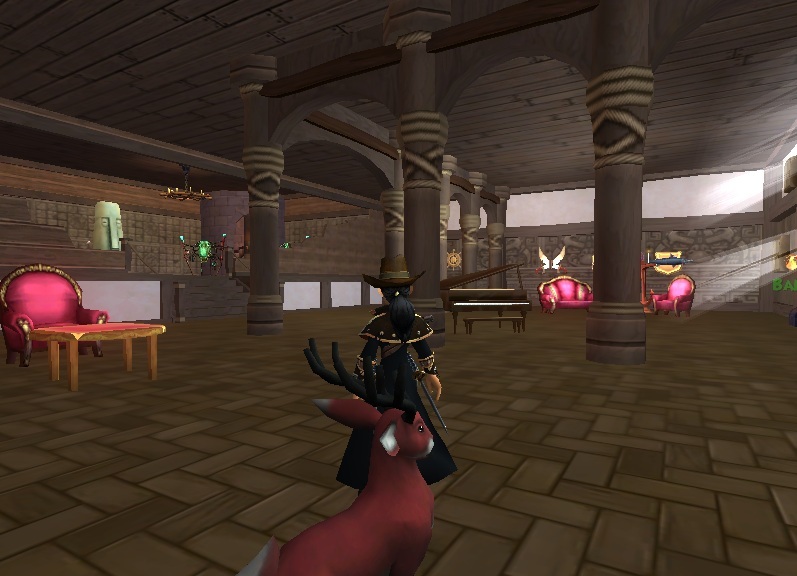 Thank you Kingsisle. :) You have made this Wizard um, eh? Pirate ;) very happy. 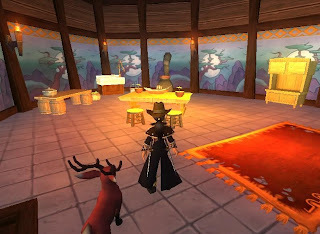 I decorated many rooms and outside areas in this amazing house and took so many images for all my readers i made a slideshow for everyone. 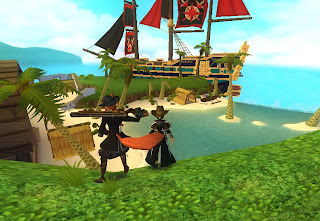 I hope all my readers enjoy this Pirate101 housing as much as I do. Until next time , happy house decorating.